This working paper examines the role and influence of business actors in the process towards the Post-2015 agenda of the UN, with particular attention to the influence of large transnational corporations. The business sector certainly has an important role to play in the implementation process of the Post-2015 agenda, as sustainable development will require large-scale changes in business practices. Some pioneering companies are already on the path towards sustainable development solutions (for instance in the area of renewable energies). However, acknowledging corporations' role must not mean giving them undue influence on policymaking and ignoring their responsibility in creating and exacerbating many of the problems that the Post-2015 agenda is supposed to tackle. This working paper starts with a brief overview of the current process towards the Post-2015 agenda and assesses its political relevance. The second part maps out the key business players involved in various processes surrounding the post-2015 consultations. The third part of the paper analyzes the key messages and policy recommendations of business actors in the post-2015 process. 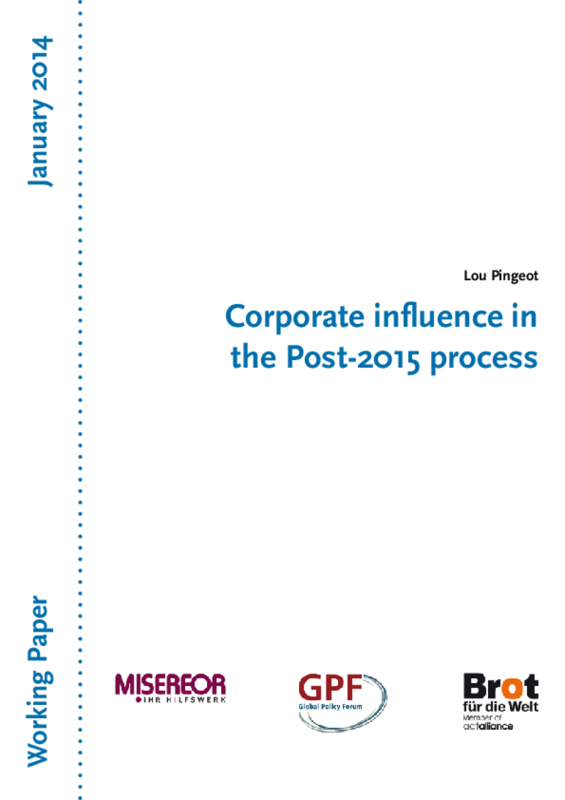 The fourth part explores the problems, risks and side-effects of the corporate influence on the Post-2015 agenda. They relate, on the one hand, to the key messages, on the other hand to the promoted governance models. The final part draws some conclusions, provides policy recommendations for the UN, member states, civil society and academia, and highlights potential paths for future research and policy work. Copyright 2014 Bischöfliches Hilfswerk MISEREOR e.V., Brot für die Welt, Global Policy Forum.